Christmas-pudding, namely Tevye). The less said about the apple pies the better, as I forgot to set the timer to remind me to turn the gas down part way through cooking them and they got frazzled. Tevye assures me he will still enjoy them, but I'm afraid they are only just the right side of the fine line between edible and inedible. 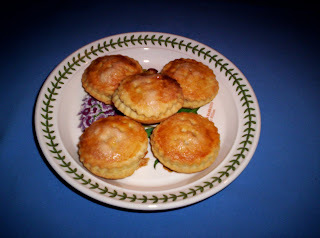 Fortunately the mince pies came out well. Wet edges of the dough circles in the tin and press the lids on gently to seal. Brush tops of pies with beaten egg white, dust with a little sugar. Bake at 400ºF / 200ºC / Gas Mk 6 for 20 minutes, or until pastry is crisp and golden brown. Leave to cool in tins. Pies can be frozen. To serve hot (from frozen) replace in tinsand reheat at same temperature for 25 minutes. I have made my own mincemeat, but decided the ready-made version was just as nice and much easier. It is widely available here, including various luxury varieties. If you want to make your own, this recipe should do nicely. I haven't tried it myself, but it comes from a reliable book - 1000 Freezer Recipes ed. Carole Handslip and Jeni Wright. I bought this used for £1 years ago, and it has become my most used cookery book. Recipes are simple and they work. It also gives both British and American measures, making it a very useful source for kitchen-type translations. Put all ingredients in a bowl and stir well to mix. Cover the bowl, leave to stand overnight, then spoon into small rigid containers or freezer-proof jars. If frozen, thaw at room temperature for 3 hours, then store in the refrigerator. Makes about 5lbs. That would fill an lot of mince pies (about 100). I would only make half quantity. It is the festival of Hannukah, when Jewish families remember how a tiny remnant of oil kept the light burning in the Temple of Jerusalem for eight days. It is traditional to celebrate with food cooked in oil ... typically latkes and doughnuts. Everyone in our family considers latkes a huge treat, so I always try to cook them at least twice during the eight days of Hannukah. The recipe I use is a recipe for children included inTevye's synagogue newsletter a few years ago. Peel and grate the potatoes. Drain off excess liquid. Add all the other ingredients to the potatoes and mix well. Heat oil in a frying pan (skillet?) - I use oil about ¼inch deep. Drop mixture into pan by tablespoons and flatten slightly. Fry on both sides until brown. Traditionally served with apple sauce or sugar, though some people prefer tomato ketchup! Great with salt beef. 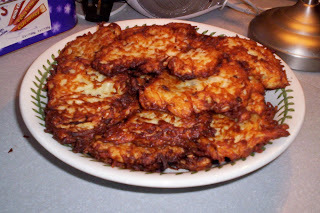 Rebecca posted a recipe for German potato pancakes on her Heart of the Kitchen blog a while ago, and the recipes are very similar ... definitely central European comfort food. Cake decoration ... and an egg bomb! Note particularly the drainer, where it appears an egg explosion had taken place. Star normally gets me to crack eggs for her, but as I had a sleeping baby on my lap she tried to do it herself. According to Angel her method was more crushing than cracking, which explains why the first egg-and-a-half missed the bowl entirely. After that Angel graciously consented to do something cookery-ish and cracked them for her. If you wonder about the table lamp on the kitchen side, it is there because the kitchen light has broken. This is a huge irritation in my life, but has not yet been irritating enough for long enough to force us to call an electrician to fix it. The cake decorating was fun, and went remarkably smoothly considering the wide age range of the decorators. They learned how to roll icing (frosting) and cover the cake neatly, and how to make marzipan fruits. Then they were given a free hand to decorate and trim their cakes. Angel's is on the left, Star's on the right. My great-grandmother, Frances Elizabeth Dugdale. Born in a North Yorkshire village in the 1860s she went into service in her teens as a kitchen maid at Nunnington Hall. Later she became a cook, I believe at Harewood House near Leeds where she would have worked in this old kitchen. This photo is another decluttering find. Would that there were recipes to go with it! This afternoon Star and I made "porridgies" (flapjacks). Star used to enjoy the Katie Morag stories by Mairi Hedderwick. So did I ... they are nice gentle picture books about a little girl living on a Scottish island with her mother and grandparents, if I remember rightly. * Three or four years ago we borrowed a Katie Morag collected storybook (title long forgotten!) from the library which included this recipe, and have used it ever since. It is quick, easy and child friendly (though my tolerance for stickiness isn't high enough to let Star loose with the golden syrup!). Melt butter in a large pan over a low heat. Add sugar and syrup and salt. Mix well. Stir in rolled oats. Mix very well. Spread mixture evenly in tray with palette knife. Bake for 25-35 minutes, till goldie brown. Take out of oven. Let cool a little. Mark in squares or fingers with knife. Leave in tray till cold. Put pieces in an airtight tin. * One caveat: Katie Morag's parents are divorced or separated, though this is more apparent in some books than others. Grannie's big kitchen table looked just like a shop, there were so many things on it. There were jars and bottles and packets, full of currants and sultanas and raisins and ginger and candied eel and a big heap of suet on a board, and a big heap of brown sugar on a plate. There were apples and oranges and lemons, and even some big clean carrots! There was a big brown bowl standing on a chair that had a big, big, wooden spoon in it. And on the draining board were lots of white basins. My sister was very surprised to hear this, and to know that all these lovely things to eat were going to be made into Christmas Puddings. ... When all the things had been put into the brown bowl, Grannie began to mix and mix with the big spoon. She gave my sister a little wooden spoon so that she could mix too. And my sister did. She shut her eyes and turned her spoon round and round. Then Grannie shut her eyes and wished. Then my sister sat quietly by the fire while our grandmother put the pudding mixture into all the basins, and covered them with paper and tied them with cloth. If you are planning to use my Christmas pudding recipe, you need to know that they do not keep as long as I first wrote in the recipe post. Apparently, the reason they are still OK to eat at Easter is because my Mum keeps them in the freezer! She tells me that they will keep for about six weeks unfrozen. Also, I forgot to add one vital piece of information ... when making Christmas puddings, tradition is that everyone gets to stir the pudding and make a wish. Can't miss that out! Star and I made this "stir-up Monday" (a little license there!) and made our Christmas puddings.